MUMM-RA summons the MUTANTS and threatens to banish them from Third Earth unless they bring him the Sword of Omens. While LION-0 is mountain climbing, the MUTANTS ambush him with Thundranium cartridges. 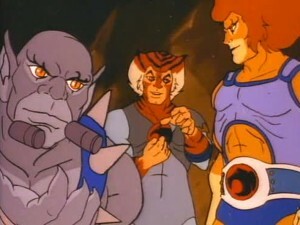 LION-0 summons TYGRA and PANTHRO with the Sword. As the weak LION-0 hangs on the edge of the mountain’s cliff, JACKALMAN grabs for the Sword and both of them go over the edge, into a river, and over a waterfall. The other MUTANTS mistakenly cause a rockslide, which traps them, TYGRA and PANTHRO in the mountain’s cave. They call a temporary truce, which the MUTANTS plan to violate as soon as they escape. JACKALMAN seizes the Sword from an unconscious LION-0 and climbs up the mountain. LION-0 catches up to him. JACKALMAN refuses to surrender the Sword and it takes him for a wild ride. The Sword flies through the air, twisting and turning, with JACKALMAN holding on to the handle, finally embedding itself in the mountain face high above the river. LION-0 saves the dangling Mutant and commands the Sword to return to his hand. He then frees the other MUTANTS, TYGRA and PANTHRO from the cave. 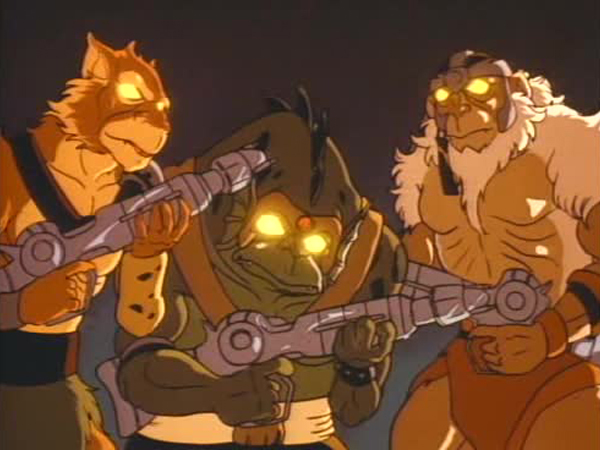 Once free, the MUTANTS start to battle the THUNDERCATS again, only to discover that while inside the cave, PANTHRO and TYGRA emptied the MUTANTS’ weapons of ammunition. Jackalman’s obsession with power prevents him from working together with Lion-O to rescue them, when they are confronted by a common danger. 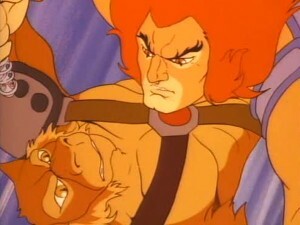 Instead, he takes advantage of Lion-O’s good deed saving him from drowning to steal the Sword of Omens. However, the power of the Sword proves to be a power that Jackalman cannot control, because it is based on goodness. Lion-O regains the Sword and uses it to free the ThunderCats and repel the Mutants. 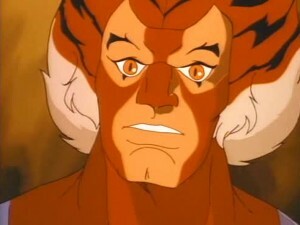 The source of the ThunderCats’ power is the power of goodness and a moral code, which comes from within. 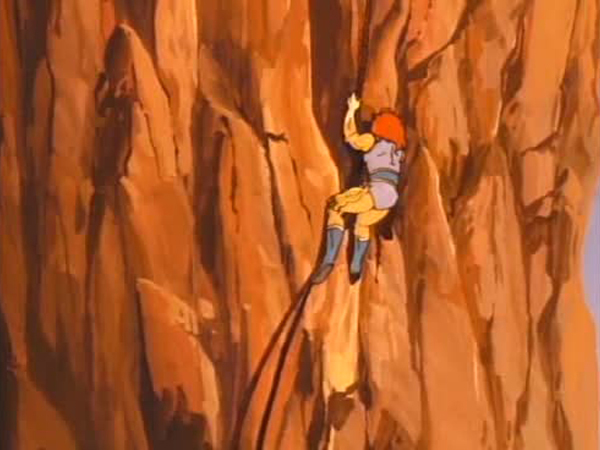 It is exemplified in this episode by Lion-O’s good deed rescuing Jackalman and by Panthro and Tygra’s cooperative working together with S-S-Slithe and Monkian to escape from the cave. The Mutants, on the contrary, seek power in external force and in evil, and they show no allegiance to an internal morality. 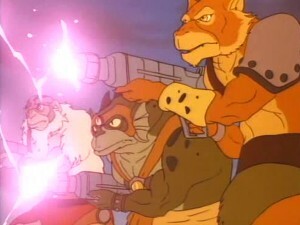 This is why they are no match for the Sword of Omens and the ThunderCats. Real strength and power rests in a morality based on conscience and the judgment of discerning good from evil. We should strive in our lives not to base our actions on external circumstances or rewards, but on the rightness of the actions themselves. Some of the earliest stories told by mankind were about the battle between good and evil. To this day our narratives often have this same conflict at their core. ThunderCats is no different and fundamentally it is the story of our feline heroes and their allies battling the forces of evil. While “good vs. evil” has been a successful formula, some writers go beyond and explore tales in which good and evil are forced to join hands to overcome a common threat. Danny Peary does just that in “The Mountain”. While it is easy to be misled by the episode’s rather unassuming title, it would be a grave mistake to judge this proverbial book by its cover. 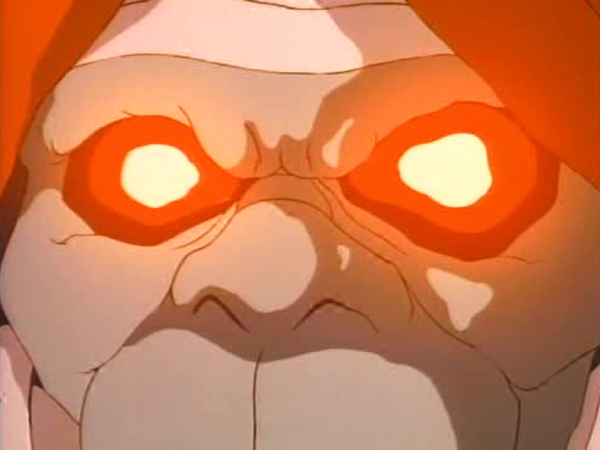 “The Mountain” begins with Mumm-Ra giving the Mutants an ultimatum: obtain the Eye of Thundera or spend eternity in exile! Judging by Mumm-Ra’s serious demeanor and the fury in his voice, the devil priest is not bluffing. And judging from the Mutants’ renewed determination, they got Mumm-Ra’s message loud and clear. 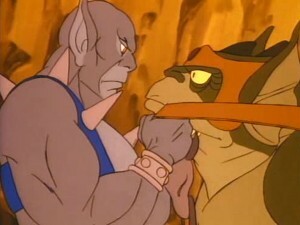 In many ThunderCats episodes, the Mutants have sadly been relegated to the role of comic relief, getting frequently defeated in a “Chaplinesque” slapstick manner. Peary returns the Mutants to their former glory by making them as fearsome as possible. The scene when the Mutants wait in the dark with Thundrainium laden weapons and eerily glowing yellow eyes is a clear indication of this. The Mutants’ renewed fearsomeness is further corroborated when the arrival of Panthro and Tygra does nothing to sway the Mutants from their goal. 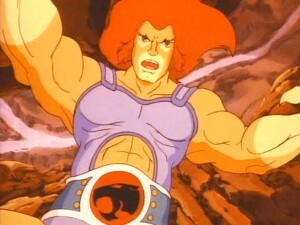 They stand and face the ThunderCats head on instead of fleeing in retreat. Unfortunately for the Mutants, their almost certain win over the feline heroes is interrupted by an avalanche of rocks. From this point, the story splits into two, with one half focusing on S-S-Slithe, Monkian, Panthro and Tygra trapped inside an air tight cave, and the other part devoted to Jackalman struggling to wrestle the Sword of Omens from Lion-O. It is solely Peary’s tight script that maintains the intensity in both the plotlines. The sequence inside the cave with diminishing oxygen supply evokes feelings of claustrophobia and a sense of urgency. Even better is the paper-thin truce between the Mutants and the ThunderCats, with both parties not having even an ounce of trust in each other but still reluctantly working together to survive. Panthro’s humorous quip directed at S-S-Slithe:“Jackalman couldn’t get you out of a wet paper bag!”, helps to temporarily lighten the mood in this very grim predicament. 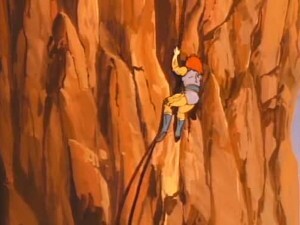 Outside the cave, the situation with Lion-O and Jackalman is a lot more animated and action packed. 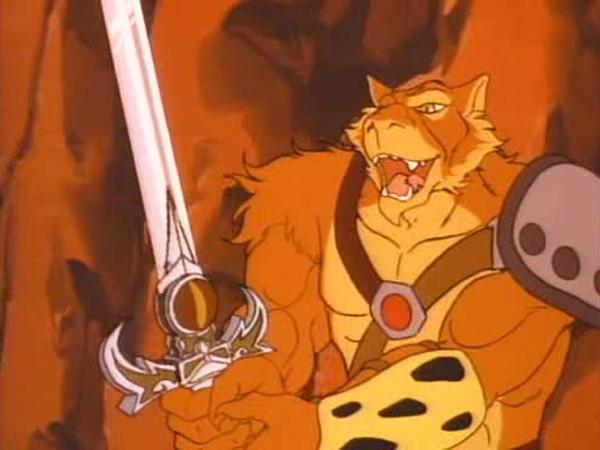 It is interesting to see Jackalman so completely devoted to obtaining the Sword of Omens from Lion-O. Even falling off a waterfall does not dampen his spirits, and he clings onto the sword all the way down the cascade. When Jackalman does eventually gain possession of the sword, he displays his exuberance in comical fashion by imitating Lion-O but with his own chant of “Plun-Darr, Plun-Darr, Plun-Darr, Jackalman HO!”. Surprisingly, after obtaining the sword Jackalman returns to the cave where his fellow Mutants are trapped instead of running off with his precious loot straight to Mumm-Ra. This display of loyalty is rare for a Mutant. The animation in “The Mountain” is top notch. 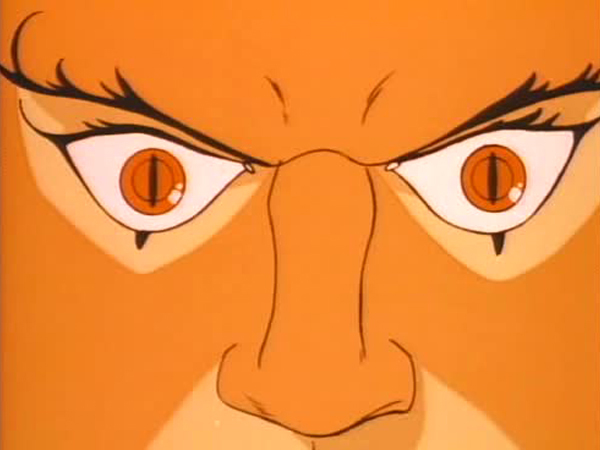 Whether it is the low angle shots of Lion-O scaling the mountain, the bird’s eye view of Lion-O and Jackalman falling down the waterfall, or the extreme close-ups of the character’s eyes, the imagery is dazzling. 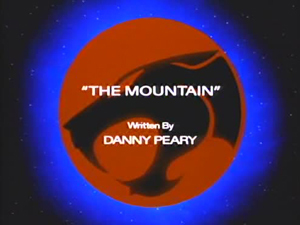 This coupled with the brilliant script by Danny Peary make “The Mountain” one of the best offerings in the ThunderCats saga. It Is a shame that Peary didn’t pen any more episodes because judging by his gripping work on this episode, he could have come up with some great ThunderCats episodes. Even though Mumm-Ra threatens to destroy Castle Plun-Darr and banish the Mutants to eternal exile if they fail this time, he doesn’t bring his threat to fruition. The ThunderCats version of Kryptonite (Thundrainium) can also drain the strength of the Cat Signal. An interesting animation anomaly is seen with the Sword of Omens in this episode. When Jackalman removes the sword from the Claw Shield, it is in its short from. But immediately in the next scene, the sword has grown to almost double its size and even the crossbars are curled upwards. 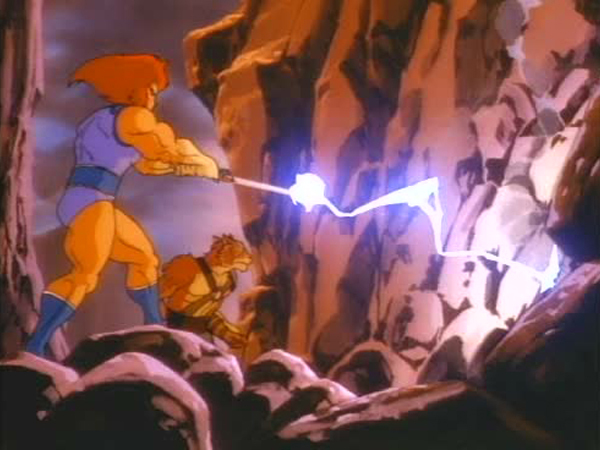 The sword remains in this state until Lion-O regains possession of it near the end of the episode. Jackalman’s response to Lion-O, “Never do a favor for a favor”, is a nod to a similar line spoken by Tygra in “The Time Capsule” when he says, “Never expect a favor for a favor”. So the Mutants and ThunderCats do have some things in common! After Lion-O rescues Jackalman for the second time, he says, “I didn’t do it for thanks”. This is an allusion to the episode “The Slaves of Castle Plun-Darr” in which the young lord says the exact same phrase after freeing the Brutemen.